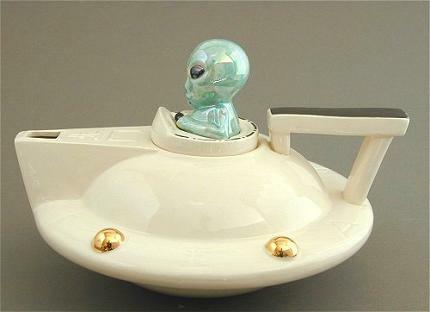 Not long ago my niece sent me a photo of the below Alien/UFO Teapot. She knows that I love tea, teapots and aliens! This is the perfect teapot for me. I absolutely love it. I ultimately found it on the website: allteapots.com and I believe it may only be found in the UK. For $84.00 I probably should just be happy looking at the photograph, although I believe it would find a happy home on my shelves in my house too! I may have to do a little research and see what other neat and different teapots I can find on the web! Next postMissoni for Target – pretty cups and saucers! Love your blog – how can I follow it? I’m not totally sure since I’m new at this, but I think just follow thru the email option at the top of page on home page. Thank you for all your kind comments!